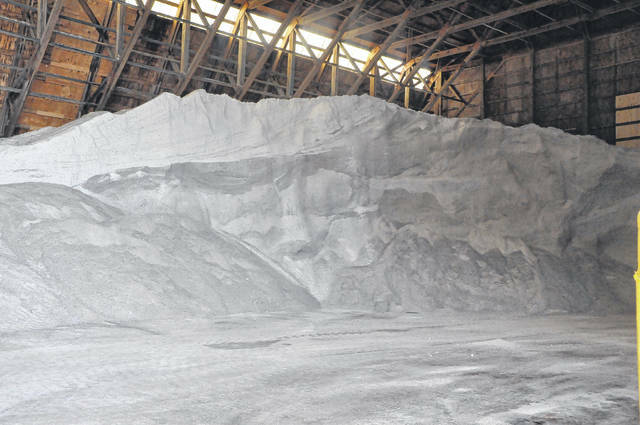 Piles of salt at the ODOT facility on U.S. 42 are ready to go in case the National Weather Service prediction of 3 to 5 inches of snow falls Friday in Delaware County. ODOT Highway Technican Lamont Shelton and other highway technicans used Wednesday as a day to service and clean off their vehicles before this weekend’s predicted snow. The National Weather Service predicts several inches of snow may blanket Delaware County and other parts of central Ohio this weekend. The weather service reports that Delaware County will see showers and a wintry mix Friday during the day. Snowfall will begin after 9 p.m. The chance of precipitation is 100 percent, the service reports. NWS forecasters estimate the new snow and sleet accumulation will be between 3 and 5 inches. Friday’s high will be 42 degrees and the low will be 17 degrees. On Saturday, there is a 50 percent chance of snow during the day followed by a clear evening. New accumulation is estimated to be around an inch. Saturday’s high will be 19 degrees with a low of 3 degrees. 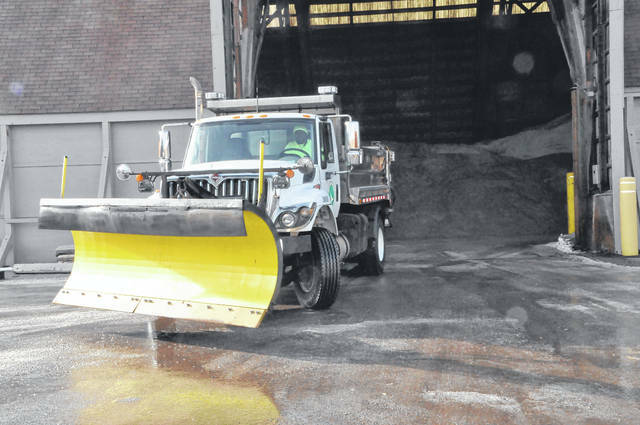 Officials at the Ohio Department of Transportation reported they were using Wednesday and Thursday to clean and inspect their trucks as well as to change plow blades so their equipment is ready to go when the next storm hits. “We’re monitoring the forecast closely and will be fully staffed,” said Breanna Badanes, a public information officer at ODOT District 6. Badanes said ODOT has about 150 trucks in District 6, which includes Delaware, Fayette, Franklin, Marion, Madison, Morrow, Pickaway and Union counties. She said ODOT is responsible for interstates, state routes and US routes. “It’s important to remember that plows often travel below the speed limit, so drivers should slow down and give the plows room to work,” Badanes said. ODOT recommends that drivers can also check OHGO.com or download the OHGO app to see real-time traffic speeds, cameras, accidents and road conditions. Sandy Mackey, deputy director of Delaware County EMA, said now is the time for residents to get prepared for the storm. “Preparedness is key,” Mackey said. • Make sure smoke alarms and carbon monoxide detectors are in good working order complete with fresh batteries. • Keep contact information handy for your utility providers — if your power goes out, you will need to be able to report it. • Have enough food, water, and medication on hand to last 72 hours. • Learn how to shut off water valves (in case a pipe bursts). • Fill your vehicles gas tank, check the air in your tires and fluid levels. • Keep a cell phone charger in your vehicle; if power goes out in your home, you can still charge your phone in your vehicle. • People who depend on electricity to operate medical equipment should have alternate arrangements in place in case power is out for an extended period of time. • Plan to check on elderly/disabled relatives and neighbors. • Plan to bring pets inside. • Know where the manual release lever of your electric garage door opener is located and how to operate it in case you lose power. • Take your time if you shovel snow; use caution and take frequent rest breaks. • Be aware of the dangers of alternate heat and lighting sources. • Never leave candles unattended. • Be prepared for power outages. • Sign up for weather alerts at www.delcoalerts.org. • The Delaware County Sheriff makes the decision on snow emergency levels. You can follow them on social media on Facebook: https://www.facebook.com/DelawareCoSheriff/ and Twitter: @DelCoSheriff. Mackey also recommended that residents just stay home if they can. For more preparedness information you can visit Delaware County Emergency Management at www.delcoema.org click on preparedness. This entry was tagged delaware county ema, Emergency, National Weather Service, snow, storms, weather, winter. Bookmark the permalink.